Warning: FRECKLES [Amazon | Scribd] is quite possibly the cutest book ever. You will squee. Carter's boyfriend just dumped him and the head of his law firm has got him working on a case that’s legally sound but morally reprehensible. He needs something positive in his life, and he gets it in the form of a tiny, fluffy puppy a kid hoists on him in a parking lot. Carter has no idea what to do with a puppy (if Freckles even is a dog and not a hamster, as her size suggests), so he rushes straight to the nearest pet store with a veterinarian attached and has the good fortune to meet Sandy, a vet tech who's willing to give the occasional cute, dog-loving lawyer some after hours help with the whole pet ownership thing. Their relationship is sweet and mutually supportive, but it's the dog angle that sold me on this nominally holiday romance. (The Thanksgiving and Christmas bits are light enough that you can read this any time of year, as I did.) Freckles is a tiny Shih Tzu/Chihuahua cross, and I recognized so much of what Carter goes through as he adjusts to dog ownership and strives to be a good caregiver for her. I've had dogs all my life, barring an eighteen-month dogless stint when I was very young, but my wee Murchie is the first dog who's really been mine. He decided I was his person mere hours after we met, despite family plans to the contrary, and I spent a certain amount of time freaking out about how I was now responsible for this 2.5-pound fluffball who was brand new to the world and correspondingly lacking in common sense. I wanted to do right by him, and I was terrified he'd get sat on or stepped on or otherwise injured during one of his exploratory forays into the great unknown1. I still worry he'll get sat on or stepped on, especially since he's a bit too inclined to trust people will notice he's there and work around him. That's a dangerous attitude to adopt when you're still only 3.5 pounds and you're the same colour as the kitchen floor, y'know? So, yes. Carter's dog ownership arc felt very real to me, not just for the anxieties but also for the joy he takes in Freckles. She brightens his whole life with the cute stuff she does and the new experiences she pushes him towards. His adjustment period reads like a sweet, fluffy adventure as he learns the ins and outs of his new charge’s personality, gauges her limits, works out a care schedule, and breaks the news about her to everyone in his life. He also gets used to being a living chair for a tiny dog who’s rather cuddle up in his lap than lay in her basket alone. Awwwww. To be honest, I’d probably be gushing to the heavens even if the whole book had been nothing but Carter bonding with Freckles. Their connection is that cute, and that easy to latch on to if you’ve ever adopted a new puppy of your own. Freckles isn’t the only important thing in Carter’s life, though, and I adore how she acts as a catalyst that brings about so many positive changes to his world. His relationship with Sandy is the main one, of course, and Sandy’s willingness to reach out helps Carter do the same as his new dog owner status widens his social circle. Sandy introduces Carter to his niece Alexis, who’s a dog-walker, and I got a huge kick out of how immediately Carter decides he likes her. (Friendship-at-first-sight always makes me grin.) The two of them bond over Alexis’s obvious love for Freckles and her enthusiasm for helping people out; something Carter would very much like to do, and feels barred from doing on account of his oppresive job. When he gives Alexis advice on setting up her new business, he starts to feel like the helping people racket isn’t so far beyond his grasp as it seems. It comes to feel even more possible when Alexis introduces him to other pet-owners who could use some legal advice, which Carter is well positioned to give alongside a nice paralegal he’s always been a bit scared to become actual friends with. The many different relationships Carter pursues because of Freckles are the best thing about the book. At its heart FRECKLES is about how bonding with a dog helps Carter realize he can click with people and aim for a better life. Not the sort of better life he’s always been told he should want, with a fancy house and a flash car, but the kind of life that’ll let him use his skills to help others, and accept their help in return when they’re positioned to give it. It warmed the cockles of my heart, it did. 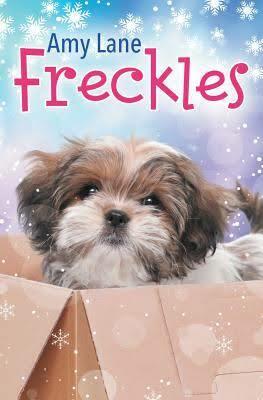 FRECKLES is my first 5-star read of 2017. Puppy!Murchie routinely smashed into things, ran under peoples’ feet, tore tendons in his legs, leaped out of shopping carts onto concrete floors, and on one horrible occasion got loose and raced into the path of an oncoming car. He also ate a giant piece of another dog’s fur on his first trip to the vet, rolled in another dog’s poop when my father took him for a walk, and tried to pick a fight with every dog we met whenever I walked him. Until he decided walks were the worst and he wasn’t gonna put up with them anymore, no sir. His childhood stressed me the hell out. This does sound pretty cute! 1 star - why the hell did I finish this? 0.5 stars - seriously. The hell??? If you've ever said, "Hey, I wish I could acquire a new book and give Memory a tiny amount of money at the same time," you're in luck! That's exactly what'll happen if you purchase something through one of the handy-dandy graphical links below! Content © Memory Scarlett, 2013-2017. Watermark theme. Powered by Blogger.